Lismore accommodation, tours and attractions. Tourist information and visitor guide Lismore NSW, 2480, New South Wales, Australia. How to get to Lismore, and Lismore weather. Lismore and Nimbin Tourism - 1300 369 795. Lismore is the Northern Rivers university town, and heart of the Rainbow region, with a wide range of visitor accommodation, conference facilities and natural attractions. With a population of just over 29,000, it is regarded as the principal city of the region. All the usual amenities of civilisation can be found here including government services, hospitals and social services. Southern Cross University has its primary campus here, and has built a reputation in the tourism, complimentary health and environmental management fields of study. Weekly farmers markets and craft markets, along with a lively pub scene, and regular concerts, events and theatrical productions, offer a range of entertainment options and things to see and do. Transport links include daily flights by Regional Express Airlines, and interstate coach services between Sydney and Brisbane, with TrainLink coaches connecting to rail services at Casino. Plentiful accommodation in the town centre includes motels, guesthouses and caravan parks, and a number of Byron Bay tour operators will pick up in Lismore for day tours to the rainforests. B&Bs, farmstays and retreats are scattered through out the picturesque villages and hamlets including Dunoon, Clunes, Bexhill and Eltham, which are the centres for local macadamia and coffee planatations. 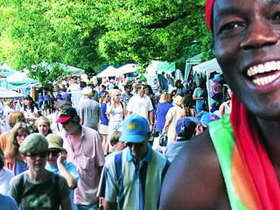 The alternative lifestyle capital of Australia, Nimbin, is a picturesque drive 20 klm to the north along winding country roads, and The Channon, which has become a magnet for the artistically inclined, holds it's famous monthly weekend market on the second Sunday of the month. The Big Scrub The Big Scrub was an area of land (some 75 000ha) in and around what is now the city of Lismore, and is believed to have been the largest single stand of subtropical rainforest in the world. In it's original state, before [European] settlement in the area, the Scrub was described as impenetrable. The area attracted large numbers of cedar merchants in the 1840's and farmers attracted by the rich volcanic soil. In the 1870's, Lismore was perceived as the timber capital of Australia, with trees falling faster than population increase. The rainforests of this area are nurtured in soils derived from the outpourings of two ancient volcanos, the Focal Peak Volcano and the Mount Warning Volcano. The lowland areas once supported the largest expanse of subtropical rainforest in Australia. Important remnants remain and provide a glimpse of past grandeur, and invite exploration. "The Big Scrub" © Courtesy of Lismore City Council. Rocky Creek Dam is the main water supply for Lismore, located a 20 minute drive from the city. You'll find a large open space picnic area overlooking the lake, with tables, free electric B.B.Qs, a shelter shed, excellent playground, toilets and well maintained walking track, including a circuit which crosses the dam spillway and loops back through the Big Scrub Flora Reserve. Mount Nardi and the World Heritage listed Nightcap National Park are within a half an hour drive of the city, with a number of easy to moderate walking tracks and loops through the rainforest. Occassional breaks along the ridgetop sections of the walks offer skyline views into the Tweed Valley to the north. Birdwing Butterfly Walk is a paved walk located in Kadina Street, Goonellabah. Planted out with a native vine to attract the rare Richmond Birdwing Butterfly, you might also keep your eye out for platypus in the creek, especially at dawn and dusk. Extract from Lismore & Nimbin Tourism "Walks and Reserves" brochure. Booyong Flora Reserve is located between Eltham and Bangalow, and was gazetted in 1930 for public recreation and protection of the native flora. A Big Scrub Rainforest Remnant of Lowland Subtropical Rainforest, there are a number of flat walking tracks which meander through the rainforest adjacent to the Wilson River. The reserve is notable for examples of White Booyong, Water Gum, Banglow palm and Walking stick palm stands. Interpretive signage is distributed along the walking tracks, and basic toilets are available at the Booyong Recreation Reserve (maintained by community volunteers) in the public field opposite (photo below). Just remember to shut the gate so the livestock don't get out. Victoria Park Nature Reserve which can be reached via Alstonville, is notable for its relatively undisturbed rainforest, with more than 70 species identified, including White booyong, Red bean, Black apple, Steelwood and Bolly gum to name a few. A circular boardwalk suitable for wheelchairs, winds through the rainforest, and picnic facilities including a B.B.Q, tables, shelter shed and toilet are provided near an information board. An Aboriginal Bora Ring in Wyrallah Road, is one of the several ceremonial grounds in the district which has been fenced off and marked with a description board. Getting to the region is easy: Lismore is approximately 780 kilometres - about 10 hours drive north from Sydney and about 90 minutes drive south from Brisbane, via the Pacific Highway. Driving options include the Pacific Highway and Summerland Way (via Casino) in New South Wales, and Pacific Highway via Banglalow, and the inland Mount Lindesay Highway via Kyogle, from Queensland. Domestic flights to and from Sydney and Brisbane, along with regional intrastate flights are available to Lismore Airport, with regional air carrier REX Airlines. Domestic flights operate from east coast capital cities into Ballina/Byron Gateway Airport, and from all capitals and a number of regional airports, into Gold Coast Airport at Coolangatta. A number of international carriers servicing SE Asia, New Zealand and the Pacific also fly into Gold Coast Airport, with all airports having airport car hire or other car rental services available nearby. Daily interstate coach services are available for Lismore to Brisbane and Sydney, with a daily or overnight train service available via coach transfer at Casino. See TrainLink services for timetables and more information. Visit Lismore - Transport Services Information for more transport information, including trains, coach and local bus schedules, taxis, airport, and transfer services. Northern Rivers Carpool provides locals and visitors with the opportunity to share transport in the region.